We just had to share these pictures, Sensa by Cosentino in Orinoco on the island unit creates a stunning visual point. Giving this kitchen the real wow factor! 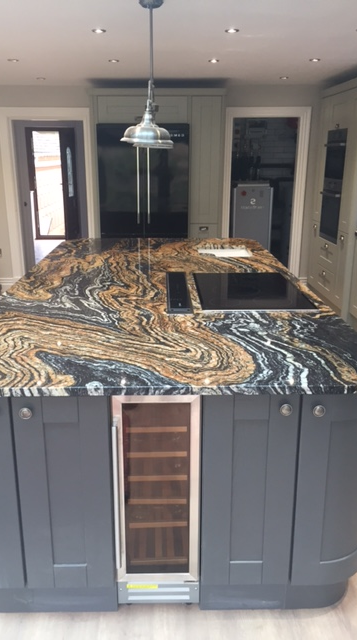 The granite Orinoco offers a totally unique aesthetic for its excellence in design and random wild veins, which are further enhanced by its bright polished finish. White, gold and copper veins are sometimes interrupted by silver minerals, which stand out against an intense black background creating an inimitable look. 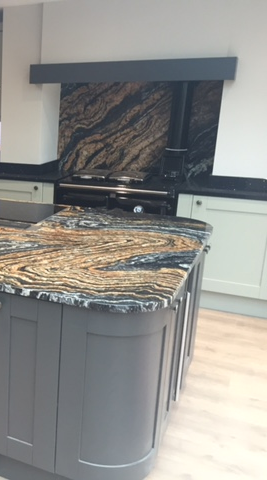 The simplicity of the contrasting dark worktops to the wall runs, combined with different coloured base units adds to the charm of this lovely kitchen.